Raith Rovers will have a different face in the dugout for their Scottish Cup trip to Hampden on Saturday. Hearts’ head of coach education Darren Murray is stepping in as assistant manager for the third round tie away to Queen’s Park. He will team up with former Hearts manager John McGlynn for the second successive Saturday after covering for usual assistant Paul Smith at Stenhousemuir last week. 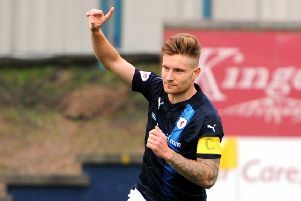 Smith, another ex-Jambo, missed the 3-1 victory at Ochilview as he was getting married - a date which was booked in the diary before he joined McGlynn as Rovers number two. Smith returned to training this week but is now off on honeymoon meaning he will also be unavailable for the trip to the national stadium. Murray will fill in, although is no stranger to the dugout, having previously managed Hearts Under 20s before leaving to join former Hearts captain Steven Pressley’s coaching staff at Coventry. He returned to his current role at Tynecastle in October last year.